Wandering the ancient streets of Pompeii, it’s easy to miss out on the real must-sees – and difficult to understand them when you do see them. Get the best from your visit with an expert archaeologist. You’ll visit all the top sights of the ruined city, including the plaster death casts, the Roman Forum, a theater, ancient fast food restaurants, the cemetery, the bakery, the main street and even the supermarket. With pre-reserved tickets, you won’t have to wait in line. Small groups of 15 people or fewer ensure that your exploration is intimate and engaging, and that you get the most from your time with our expert guides. There’s no better place in Italy to experience life as an ancient Roman than at Pompeii. And the best way to experience Pompeii? With an expert Walks of Italy tour guide! 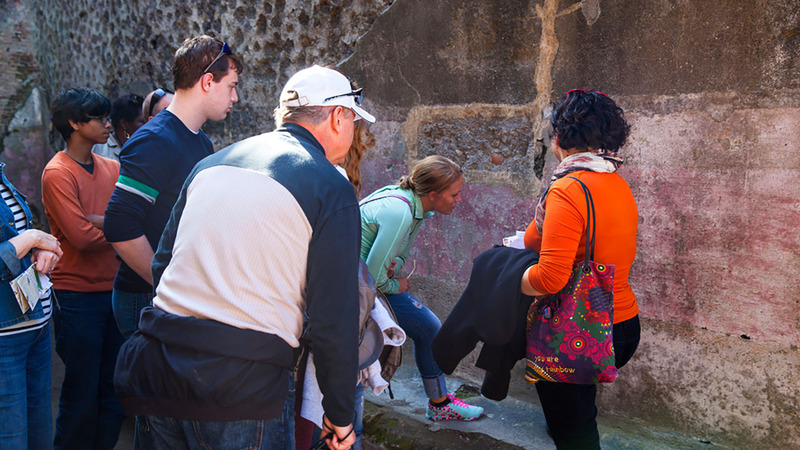 That's not just because your guide brings the sights to life with spine- tingling tales from Pompeii's past. It's also because the site is huge, while signs on the ruins are old, hard to read, and usually with only dull, cursory information. Experience Pompeii without the stress of following a map and trying to decipher ruins by yourself. With an expert archaeologist on hand, you'll be taken right to the coolest sights Pompeii has to offer and truly understand what they are. You’ll see all of the most popular sites, including a Roman bakery and the Roman Forum. You’ll learn what Ancient Romans ate and drank, what they did for fun and the sad, misguided beliefs they held about the cause for those ground tremors they felt before the eruption, or the frequent clouds of ash from the nearby Mt. Vesuvius. 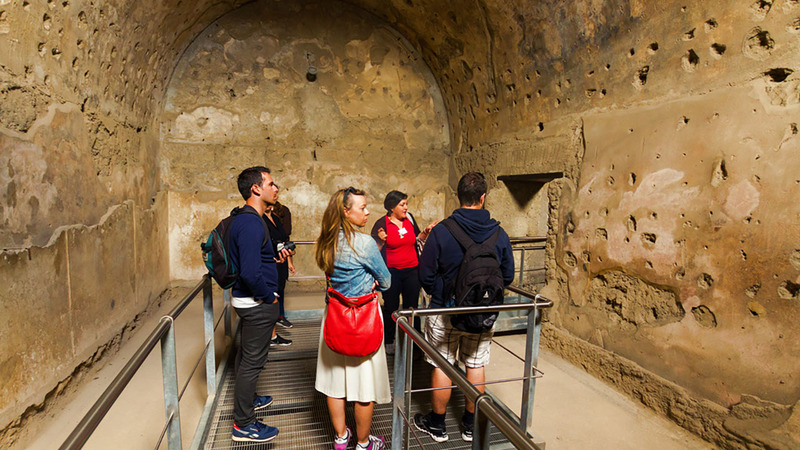 Of course you’ll visit what, for many visitors, is the highlight of their Pompeii tour – the world-famous plaster casts of those killed in the eruption; eerie and moving glimpses of what it must have been like to experience Armageddon. 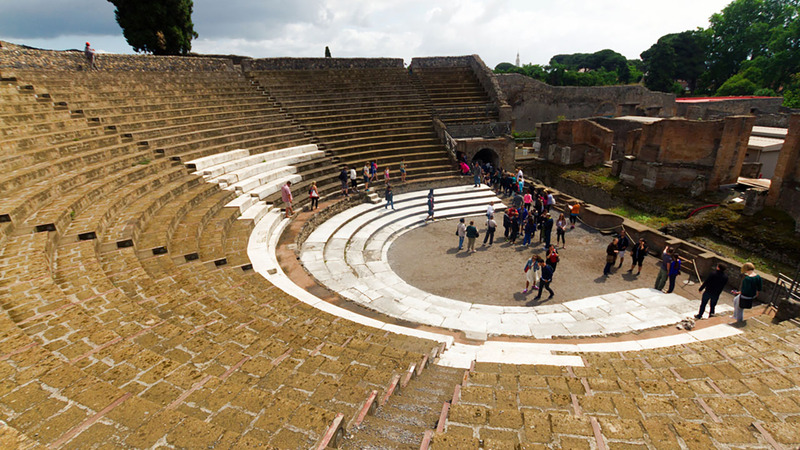 We recently extended our Pompeii tour to include one of Pompeii's beautiful theaters, which are amazing well-preserved so you can easily imagine what it was like to watch a performance here in summer, on a warm Italian evening. 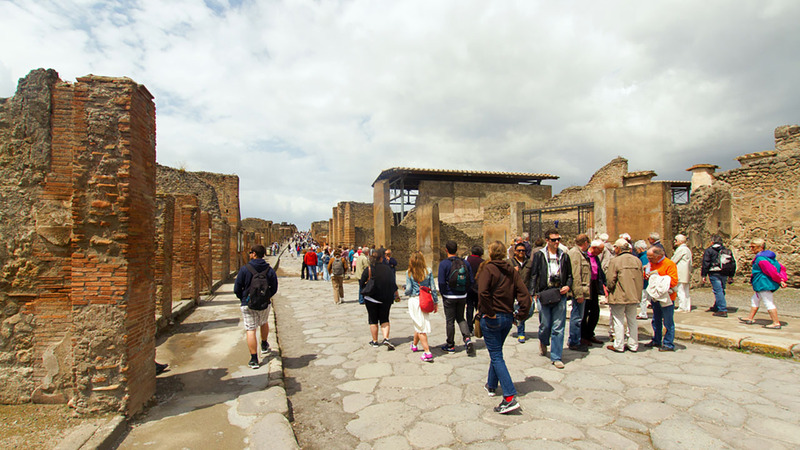 Tour operators are required to use official Pompeii tour guides at the archaeological ruins. We’ve chosen only the best of the bunch to work with, hand-picking guides with passion and knowledge, not to mention the storytelling skills required to bring this incredible city to life for you. As on all our tours, we only work with the best 5- star guides, because we understand that they’re the most important element of any tour. So when you walk with Walks, you can trust that you’re getting the best. 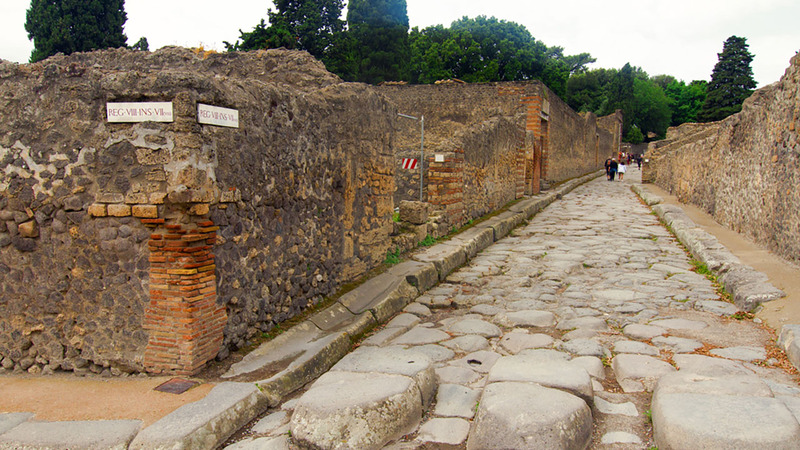 If you take a guided tour on only one stop of your Italy vacation, make it Pompeii. With the power to entrance and delight, Pompeii is a hieroglyphic of a site, needing an expert touch to translate. But in the hands of the right archaeologist, it truly comes to life as a living, breathing city. For details on how to reach Pompeii from Rome, Naples or Sorrento, see our Important Notes page (link below). Paulo was brilliant! Couldn't have wished for a better guide! He brought Pompeii alive for us with his descriptions and background information. Very knowledgeable and great company. Thank you for such an excellent tour. Guide was knowledgeable and personable. Great job! Our guided tour was flawless, everything was great. Francesca, our guide, was perfect. Would be nice to have included one of the gardens in this tour. Great information and we were able to hear quite well with the headsets. Loved the tour. Ilaria - was fantastic and very very very knowledgable. Could not be happier. Reaching Pompeii by train from Rome: First, take a train from Rome (“Roma Termini”) to Naples (“Napoli Centrale”). You can view train times, prices and book your tickets in advance on www.trenitalia.com. We recommend taking the fastest train, Frecciarossa, which takes about one hour. Once at the Napoli Centrale train station, take the Circumvesuviana train, which you can access directly from the Naples station. Take the Napoli-Sorrento Circumvesuviana line. Trains leave about every half hour, arriving at the Pompeii Scavi – Villa dei Misteri stop in about 30 minutes. For more information about the Circumvesuviana train schedule, please visit: http://www.vesuviana.it/web/en/Orari. By train from Sorrento or Naples: Take the Napoli-Sorrento Circumvesuviana line. Trains leave about every half hour, arriving at the Pompeii Scavi – Villa dei Misteri stop in about 30 minutes. For more information about the Circumvesuviana train schedule, please visit: http://www.vesuviana.it/web/en/Orari.